Poor old Santa. Not only does he have the busiest day ever on Christmas Eve rushing around the WHOLE WORLD delivering presents, but all he gets from well-meaning parents around the globe to keep him going is a stodgy mince pie or two. No wonder he’s so fat. Personally I think Rudolph gets the better deal – I’d take a carrot over a mince pie any day of the week to avoid all that refined sugar and gluten in my tum. Well this year, things are going to change in the Hollingsworth household. After having to help squeeze her husband out of one chimney too many, Mrs Claus has had a word with Mrs H and together we’ve decided that what the big FC needs are energy balls. But he’d be upset if they didn’t have a festive touch (he does wait around for it for 364 days a year in the most freezing country ever after all) so I’ve come up with these Christmas pudding energy balls. They’re just divine – fruity, chewy and packed with Christmas spices and flavours – and they’re totally guilt free! And they look pretty cute too – I’ll be serving some up on the 25th for sure as Santa shouldn’t be the only one who gets to enjoy these! And who knows, the man himself might be cutting a much svelter figure this time next year! 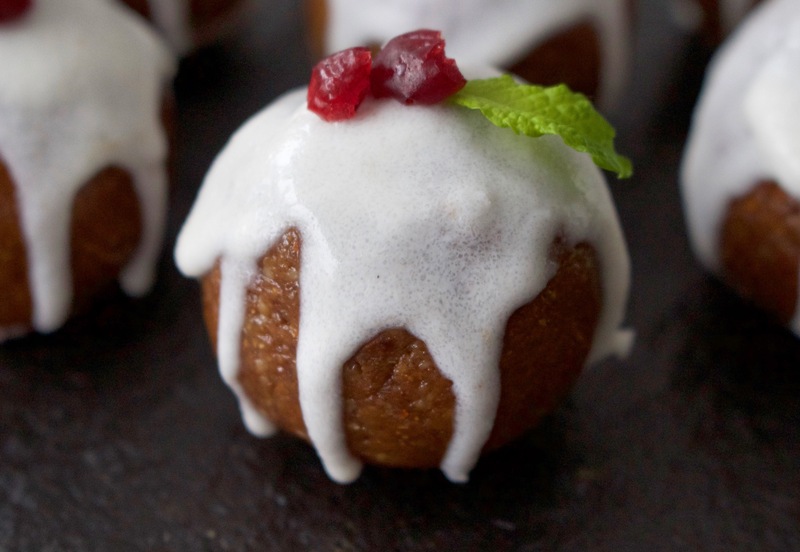 For the balls, pop the ingredients in a food processor and whizz for 2-3 minutes until gorgeously sticky and gooey. Put the mixture in the fridge for half an hour to allow it to harden a little, then roll into balls and place in the freezer for at least an hour so that the icing sticks nicely. To make the icing, simply add the ingredients to a blender or mixing bowl, and blend or stir until everything is completely combined and you have a lovely runny icing. 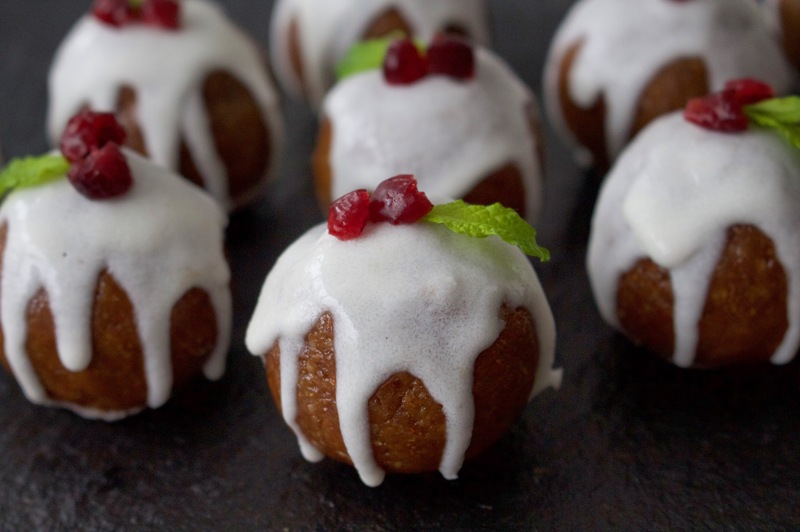 Remove the balls from the freezer and drizzle the icing on top with a teaspoon. Decorate with mint leaves and berries and there you have it!